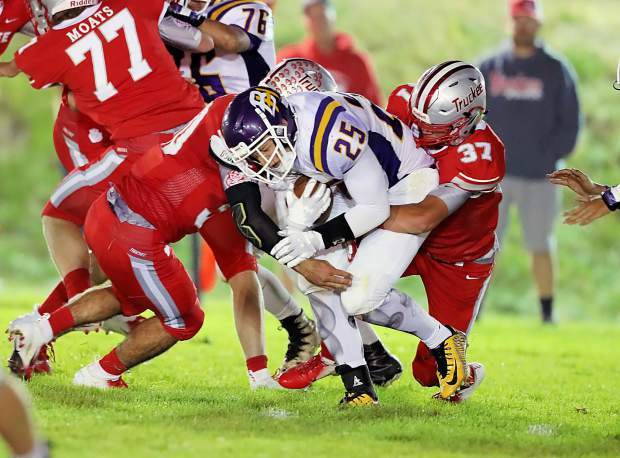 George Skaff (37) and Jackson Skaff bring down a ball carrier during Truckee's win agaisnt Bret Harte earlier in the season. Late in a blowout win against Bret Harte earlier this season, Truckee’s No. 37 enters the game. His eyes meet with fellow linebacker, No. 30 — a subtle cue, followed by a quick read, and a split second later, the two linebackers are bringing down the Bullfrogs ball carrier. “Tackle made by the Skaff brothers,” echoes from the stadium speakers. The two brothers, senior Jackson Skaff and junior George Skaff, are both playing key roles in Truckee’s 3-1 start to the season, and are enjoying the first time on the field together since they were youngsters on the same Pop Warner team nearly a decade ago. Nearly 10 years after first suiting up together, the brothers again share the field as teammates, with Jackson serving as the team’s starting middle linebacker and running back, while George rotates at tight end and subs in at linebacker. The two have seen the defensive side of the ball together on several occasions this season, and during those times, George Skaff, who grew up playing mostly cornerback, relies on the help of his older brother. “He guides me for the most part,” said George Skaff. “We have the same reads just on different sides of the ball, and then we kind of have just a brother connection out there. It’s nice to have him as a mentor on the field. The brothers see more time together during the Wolverines’ offensive possessions with Jackson Skaff among the team’s top producers, having piled up 201 rushing yards and two touchdowns thus far; while George Skaff helps spring his brother, blocking from his tight end position. The Skaff family’s presence at Truckee’s games isn’t limited to the two brothers. George and Jackson Skaff’s father also roams the Wolverines sideline, serving as the team’s doctor. Often times with teams that have siblings or parents involved, the season is marked by the highs of coming home with a win, or a silent family dinner following a loss. For the Skaff family, however, losses, like the one the team suffered last Saturday to Churchill County, are met head on. Aside from athletics, the Skaff brothers are involved in big mountain riding during the winter season, and participate in extracurricular activities at Truckee High School. Both serve as members of Truckee’s Athlete Committed program, helping encourage their peers to avoid drugs and alcohol. George Skaff is also a member of the Link Crew, a peer mentor program. The Skaff brothers and the rest of the Truckee Wolverines (3-1, 2-1 Northern League) will hit the road in week five, and will face Lowry (2-2, 1-2 Northern League) on Friday, Sept. 14. Kickoff is scheduled for 7 p.m.
“I’m a proud father on that sideline,” said Dr. Skaff.